Brooklyn, N.Y.—The administration of Long Island University here locked out the teachers and staff in early September. What they didn’t count on was the determination and united resistance of the professors, others on the teaching staff and the students. But that is exactly what they got: students and teachers together on the picket lines and at rallies. 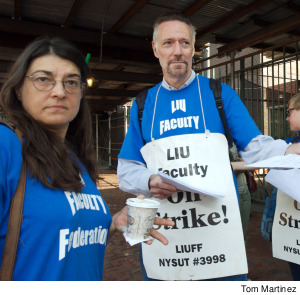 Faculty members Laura Koenig and Brook Stowe on strike at Long Island University. Photo: Tom Martinez. Students were vocal in complaining about the low quality of the scabs that had been hired to take the place of their teachers. Although New York City currently has a glut of overeducated people who cannot find work in this job market, few if any crossed the picket lines. The University was forced to use unqualified personnel to handle the classes and students reacted in anger. The whole affair came to a climax on Sept. 14 when the University bowed to the pressure and agreed to end the lockout and extend contract negotiations until next May. When combined with a recent National Labor Relations Board decision allowing graduate students at universities to unionize as the workers that they actually are, the U.S. labor movement has opened a new front: the battle for workers’ rights in the halls of academia. This entry was posted in Alerts & Appeals, Articles and tagged Brooklyn, contract negotiations, lockout, Long Island University, Natalia Spiegel, National Labor Relations Board, New York, NLRB, Picketing, scabs, strike, students, teachers, unionize, workers' rights. Bookmark the permalink.